What an honor to welcome all of you to Eich Middle School. Warren T. Eich Middle School, which was originally opened in 1964 as a 7th/8th-grade Intermediate School, has experienced many successes academically, athletically, and within the community. In 1999 and 2013, Eich was selected as a California Distinguished School and was also named a National Blue Ribbon School in 2000. During 2006 Warren T. Eich received recognition as a Project Fit America School and in the fall of 2008, Eich became an AVID (Advancement Via Individual Determination) National Certified School. Recently, in January of 2016, Warren T. Eich become an International Baccalaureate (IB) World School. As an IB school, all Eich students take a Foreign Language and a Visual Performing Arts as part of their daily core class schedule. Under the Visual Performing Arts, students at Warren T. Eich have the opportunity to take Beginning/Advanced Art, Communication Technology, Advanced Technology, Beginning/Advanced Woodshop, Yearbook, Beginning/Intermediate/ Advanced Dance, Beginning/Advanced Drama, Drum Line, Guitar, or Choir/Musical Theatre. For more detailed information on Eich’s International Baccalaureate (IB) Program please go to www.IBEich.com. Athletically, Warren T. Eich offers Girls’ & Boys’ Volleyball, Cross Country, Competitive Flag Football, Girls’ & Boys’ Basketball, Wrestling, and Track & Field as after-school competitive sports. Since 1997, Eich boasts over 40 athletic championships while competing in the Foothill Interscholastic Sports Athletic League (FISAL). Warren T. Eich also has strong ties with the community by participating, on a yearly basis, in the annual Lions Club Canned Food Drive, a Toy Drive which supports Woodbridge Elementary School’s Giving Tree to supply gifts and books for underprivileged students during the holidays, Eich’s Jingle Bell Run which raises money for low-income Eich families, and St. Baldrick’s in the fight against cancer. Finally, Warren T. Eich offers classes and programs that fit the needs of a diverse student population through Accelerated classes in Language Arts and Social Studies/History, Advanced Placement/Accelerated Math classes, the weekly Intervention and Enrichment block periods, which allows students reteaching and/or academic extension opportunities, English Language Learner (ELL) classes, the Bridges program for students who need extra academic support in core classes, Heritage Speaking classes as an alternative for those who are fluent in Spanish and may not require basic Levels 1 & 2 Spanish classes, the Math Olympiad and Science Olympiad which offers students the opportunity to compete in individual and team math and science competitions, Destination Imagination (DI) which allows students to compete in math, science, engineering, and performing arts team competitions, and the Functional Skills Program (FSP) class which services students with severe autism and down syndrome. 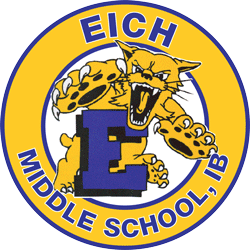 We welcome all of you to Wildcat Country and look forward to another successful year at Eich Middle School.